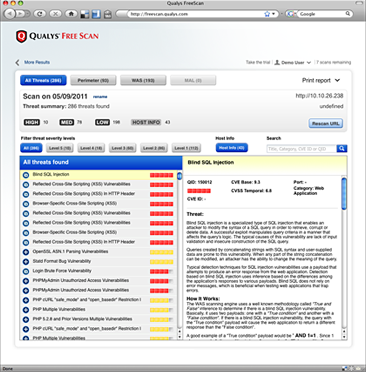 Qualys today announced the availability of its new and improved FreeScan service to help small and medium businesses (SMBs) audit and protect their web sites from security vulnerabilities and malware infections. The new FreeScan service allows SMBs to scan their web sites for of malware, network and web application vulnerabilities, as well as SSL certificate validation, helping web site owners identify risk before hackers do in order to prevent data beaches and protect online visitors from infections. "Web sites are often vulnerable to attack, and oftentimes sites are compromised without the knowledge of the web site owners or its users," said Scott Crawford, research director for EMA. "While organizations want to ensure security, many lack the resources to identify possible security issues, or they do not know where to start. 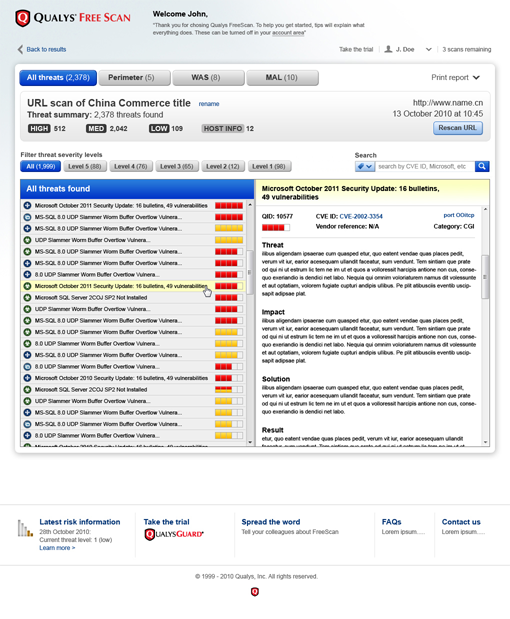 Using a free service like Qualys FreeScan can help organizations proactively gain visibility into possible issues so they can take the steps needed to protect their web sites and online visitors." The scan results also provide guidance on remediation to fix identified vulnerabilities and remove malware infections. The new service is available at https://www.qualys.com/forms/freescan/.